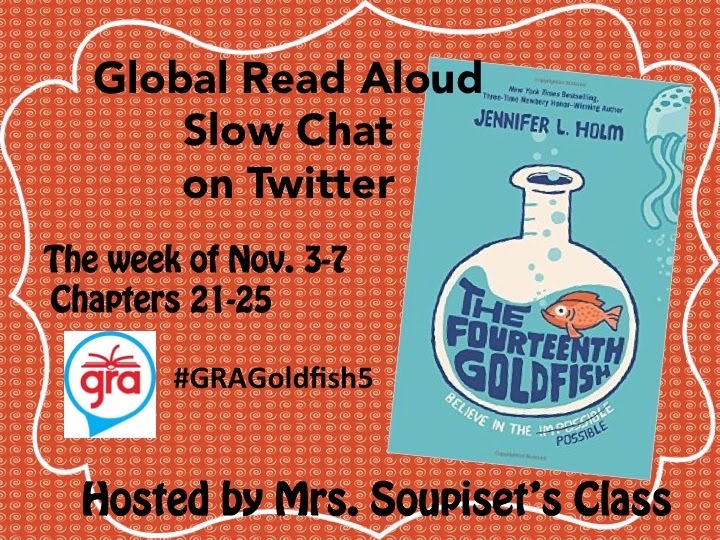 This week, my friend Amy and her class, will host The Fourteen Goldfish Global Read Aloud slow chat on Twitter. A slow chat means that Amy's class (@teamwonder2014) will ask questions throughout the week and your class can answer them any time. The hashtag for the slow chat is #GRAGoldfish5. The chapters for the week are chapters 21-25. There is a hashtag for general 14th Goldfish tweets and that is #GRAGoldfish and then there is the #GRA14 for the whole event this year. There are over 300,000 students registered for this year's GRA. I hope you will join Mrs. Soupiset's class for the slow chat.